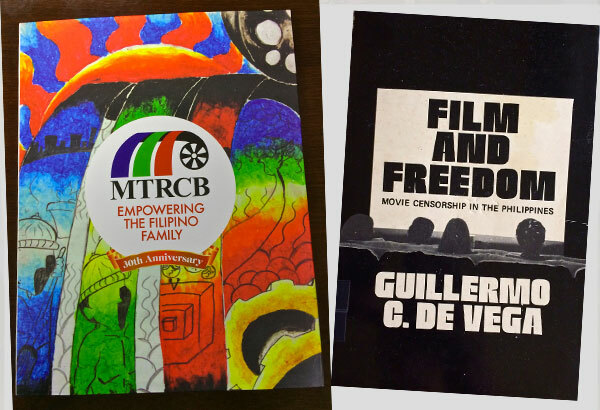 Exactly a week ago, the MTRCB (Movie and Televison Ratings & Classification Board) celebrated its 30th anniversary with the awarding of the top three prizes to the winners of a scriptwriting contest, as well as the launching of MTRCB: Empowering The Filipino Family, a 176-page commemorative coffee-table book. In keeping with MTRCB’s developmental character, the committee on senior citizens headed by board member Marra PL. Lanot launched a scriptwriting contest on the theme of empowering senior citizens. Over 70 entries were received despite the brief time frame. Judges were vice chair and veteran director Maning Borlaza together with board members director Joey Romero and scriptwriters Manny Buising and this writer. Winning third prize was Kristofer Ted S. Navarro’s draft script “Kadugo” — about a grandmother who tests her two grandsons as to who should inherit her wealth, depending on how each would treat a total stranger of a senior citizen who will live in their respective homes. Ronald Espinosa Batallones won second prize for “Excuse Me Po” — on an old woman who becomes a beggar to sustain her grandchildren, and whose life is made into a film, with herself in the starring role. The first prize went to “Malolos-Mabini-Malate” — on the bonding between a granddaughter and her lolo as conducted through music composition and performance. The collaborating writers were Perteran Briñas, a playwright and film enthusiast who has produced musicals for Philippine Educational Theater Association (PETA) and Onstage at Greenbelt, and Celina Peñaflorida, a freelancer who recently served as production assistant and marketing assistant for the blockbuster film Heneral Luna. All the winners received their certificates and cash prizes of P30,000, P20,000 and P10,000 at the 30th anniversary event hed at Luxent Hotel. Also present at the affair, apart from various stakeholders from the film and television industry and media, were former MTRCB chairs Manoling Morato and Marissa Laguardia, as well as former OIC Dennis Manicad. They joined current chair Atty. Eugenio “Toto” Villareal in the unveiling of the book, sample double-spread pages of which were also displayed at the lobby. The contents include: “History of the MTRCB: Early Precedents”; “Board Leaders Through the Years”; “Concerns of a Censors Chief” by Ma. Rocio de Vega; Excerpts from “Media Control and Censorship During Martial Law” by Jose F. Lacaba; “Armida Siguion-Reyna at the MTRCB” by Bibeth Orteza; “The MTRCB Building Project”; “Voices from the MTRCB Staff” with essays by Susan Bandolin (“Inclusive of Miracles”), Lorenzo M. David “Monitoring and Inspection”), and Armando Villas (“The MTRCB Employees Association”); “Activity Album” with essays by Jian Carlo S. Christi (“Activities”) and Maloli Espinosa-Supnet (“The Cable and Digital Television Committee”); and auto-profile pieces by each of the board members and the board leadership consisting of executive director Ann Nemenzo, vice chair Emmanuel Borlaza and chair Atty. Toto Villareal. Credit for creative assistance is due our fellow BMs Marra PL. Lanot, Milo Sogueco for the superb portraits, and Bibeth Orteza, Maloli Espinosa-Supnet and Eric Mallonga for their extended writing contributions, as well as book designer Orland Punzalan, former vice chair Pete Lacaba for his essay on censorship and premier screenwriter Ricky Lee for lending archival materials. The board actually went through various names, from the initial Philippine Board of Censorship for Moving Pictures (BCMP) when Commonwealth Act No. 3852 was enacted on Nov. 27, 1929, to the Board of Review for Moving Pictures (BRMP) in 1936, thence the Board of Censors of Motion Pictures (BCMP) with the enactment by Congress of Republic Act No. 3060 on June 17, 1961, placing it under the Office of the President. In 1969, Dr. Guillermo de Vega assumed the chairmanship, with Nick Joaquin serving as vice chairman in 1970. Upon Dr. de Vega’s unfortunate demise in 1975, President Marcos appointed his widow, Ma. Rocio de Vega, as chair of the BCMPT or Board of Censors for Motion Pictures and Television. On Nov. 13, 1981, Executive Order No. 745 modified that to the Board of Review for Motion Pictures and Television (BRMPT), which then became the Movie and Television Review and Classification Board or MTRCB, through P.D. 1986 which took effect on October 5, 1985. The BRMPT had Maria Kalaw Katigbak as its last chair, while Manoling Morato became the first MTRCB chair, serving from 1986 to 1992. Over the past 30 years, the agency has fully evolved from a censors body to a ratings and classification board under the successive leadership of the following: Atty. Henrietta “Etta” Silos Mendez (1992-1995), Jesus C. Sison (1995-1998), Armida Siguion-Reyna (1998-2001), Nicanor G. Tiongson (2001), Alejandro R. Roces (2001-2002), Marilen Dinglasan (2002), OIC Atty. Dennis G. Manicad (2002-2003), Ma. Consoliza “Marissa” Laguardia (2003-2010), Mary Grace Poe-Llamanzares (2010-2012), and current chair Toto Villareal. 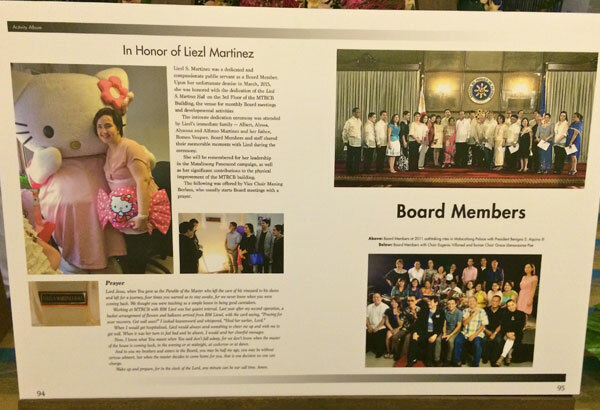 The commemorative book (left) documents the board’s evolution from 1930 to the present. Former board chair “Gimo” de Vega authored this seminal book (right) in 1970. Discerning viewership and dynamic self-regulation for age-appropriate and audience-sensitive content, both anchored on respect for the dignity of the human person, summarize the MTRCB’s vision as well as mission. This requires the empowerment of all stakeholders — producers, networks, relevant government agencies, educators, formators, faith-based entities, and most especially, families. And within families, parents and their children. … Our board members have therefore upped the ante with respect to their core competence of rating content — keeping abreast of laws and the latest forms of expression as well as technology and such other developments in the industries. We have reached out to players in the cable and satellite television sectors, even as we have started to brace ourselves for more content with the advent of digital terrestrial television service. The MTRCB’s digital theater and preview room complex, the Pribyuhan, recently activated its 3D facilities. We look not into the Philippines only, but to other jurisdictions for best practices and innovations. Of late, we have engaged with the Motion Picture Association of America (MPAA), the Netherlands Institute for Classification of Audiovisual Media (NICAM), and the Korea Media Rating Board (KMRB). It is our goal to make the MTRCB truly world-class in terms of both competence and technology. We have institutionalized, with learning modules and formats for various types of audiences, Matalinong Panonood seminars, workshops, trainings, and get-togethers for schools, universities, colleges, local government units, community associations, and faith-based entities, not to mention for industry players such as film companies and television networks. … The MTRCB was always seen as a kind of “moralistic” ogre. Without necessarily passing judgment on those who have gone before us (who perhaps were just children of their time), it has been my and the board’s passion to deal with the film and television industries as co-sojourners in the journey towards development. Ours is an engaged board, firm in our mandate, and yet ready to listen and open to authentic innovation. We encourage citizenship on the part of our viewing audience, grounded on a working knowledge of applicable law and regulations complemented by media literacy. The ratings and classification system that we are guardians of must be one that animates the lives of all. I trust that all of us in the board will be here doing our darndest best to make this a reality.